The yoke is a wonderful design device. Its seaming may conceal the dart control (Fig. 70a). 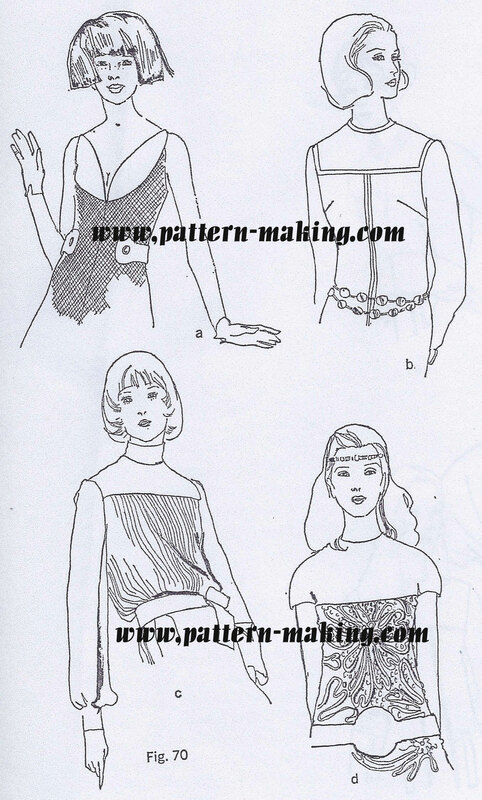 Where there is no control it may simply divide a bodice or skirt into interesting areas (Fig. 70b). Often, it provides a smooth, trim area in contrast to fullness in an adjoining area (Fig.’ 70c). It is a common device for separating a highly decorative area from a very plain one (Fig. 70d). 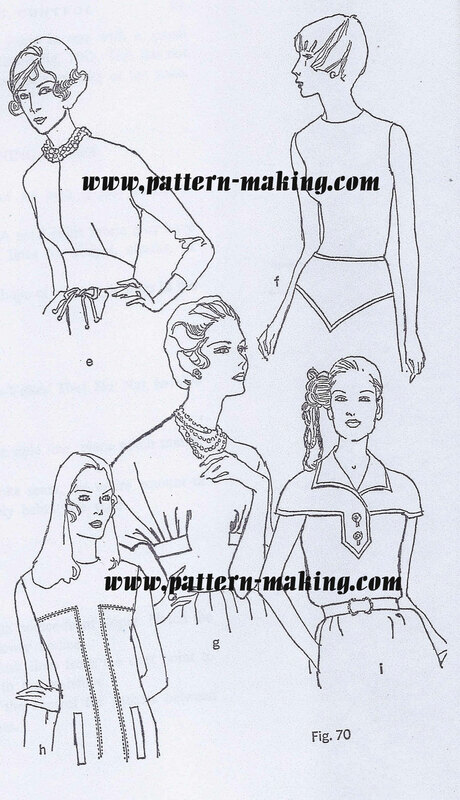 When a yoke appears in the lower bodice, it produces a smooth, fitted midriff (Fig. 70e). 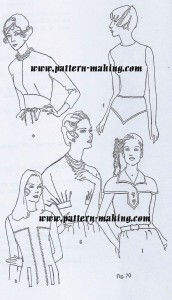 When it appears in the upper part of the skirt it is a hip yoke (Fig. 70f). In its very narrowest form, a hip yoke becomes the contour belt. There are partial yokes (Fig. 70g), yokes in one with a panel (Fig. 70h), and yokes in one with a sleeve (Fig. 70i). This has not begun to exhaust the endless possibilities and versatility of the yoke. Remember that an equal division of an area is not nearly as interesting as an unequal division. Use lines appropriate for the fabric. A solid-color fabric may have straight or curved lines. Use straight lines for stripes, checks, or plaids. Relate the shape of the yoke to the shape of other style lines in the garment. On the appropriate sloper, draw the style line, place notch marks and establish the grain, cut apart. When there is no control in the yoke seam, the entire amount of dart control may be used decoratively below the yoke. 1. 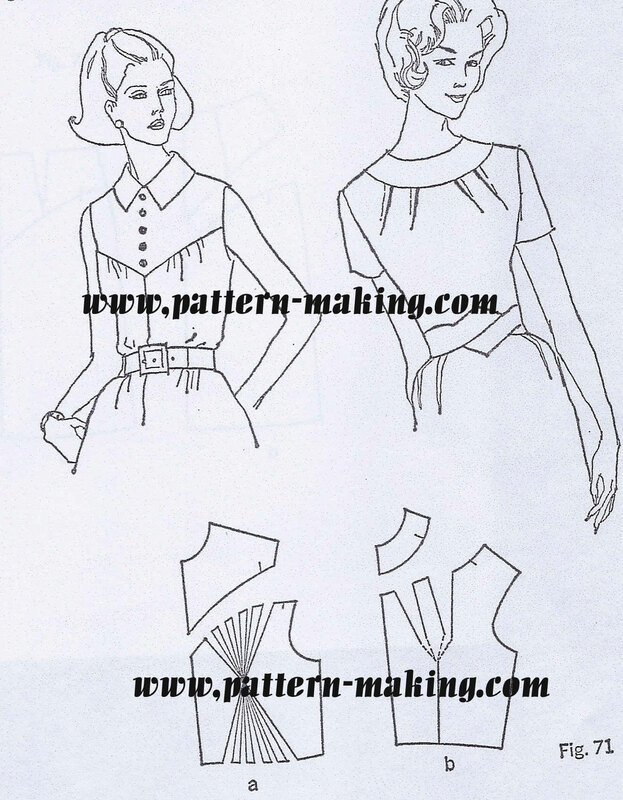 Draw the yoke style line on the bodice-front sloper. Notch the style line. Cut the yoke from the lower bodice. .
2. 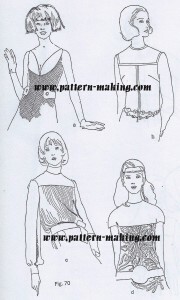 On the lower bodice draw slash lines from the dart point to the yoke and from the dart point to the waistline. 3. Slash all slash lines. Divide the control for gathers between the waistline and the yoke style line. 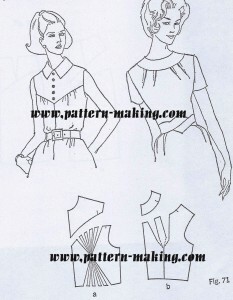 1.Draw the yoke style line on the bodice-front sloper. mark notches. 2.Draw the position of the darts. Connect them with the dart point. new darts, dividing it equally between them- Draw new dart legs.